The washing machine is going well. Reading the new Myer catalogue, I thought I could feel smug that I’d paid $200 less than their sale price of $1099, then I noticed that the mob I bought it from has since dropped it by $80. Ah well, still happy with it. The only question is — should I peel off the energy and water rating labels, or leave them there for prolonged smugness? What do the rest of you do? Peel them off, or leave them on? Leave them on only until better ratings are commonplace, perhaps, and the 4 and 4.5 star stuff seems sad and pathetic and wasteful? Normally I am too polite to say anything but then I read your question. I was thinking, oh, the stickers. Ugly. Rip ’em off. no way!!! leave them on! hopefully you will own the washing machine for so long that the stickers will fade. PS Caught the 216 bus into town this morning as no trains on Sandy line. I think we left ours on the washing machine, because it’s hidden in a cupboard, but we took them off the dishwasher. We have a Bosch dishwasher Daniel… expensive but well worth it. You can barely hear the thing. oh congrats. We’ve left ours on. We have a 10yo bosch and it has a 5 star energy rating, though its a 6kg capacity only. The water rating does not use the stars, just a AAA water conservation rating. For that added smugness, on the same sticker there is a 2year warranty boast as well, though that might be a bit lame there days. Left mine on the fridge but it’s hidden under the many magnets and notes. I recently bought a fridge and washer – my attempt to peel the sticker off the fridge means I have left them on the washer – why oh why aren’t they easy peel labels? Yes, whether or not the stickers would come off cleanly was the other thing making me reluctant to peel them off. This machine sure seems to have a cycle to suit every fabric type. How many cycles do you actually use/need? If you heat the stickers with a hair dryer first they are much easier to peel off. (Should you decide to remove them.) A little WD-40 will remove any goo left behind and some Windex will remove the WD-40 residue. I’m generally using Mixed Load, though I have used Delicate and Cottons, as well as Drain when I realised just after I’d started it that I’d left something out. Some of the higher end models have way more settings, but I think these are just about right for me. I’m not sure what size my old Hoover machine was, but this one is bigger, which means I’ve had to adjust my usual patterns of washing to make economical use of it. Have got used to it though. Eucalyptus oil will remove any sticky residue. I’d remove them now, if I was you. Why? Because as the labels age they’ll get harder to remove. That’s my feeling anyhow. The feeling of smugness is sweet however. Daniel, the thing you can feel really smug about is the fact that you bought a front loader. 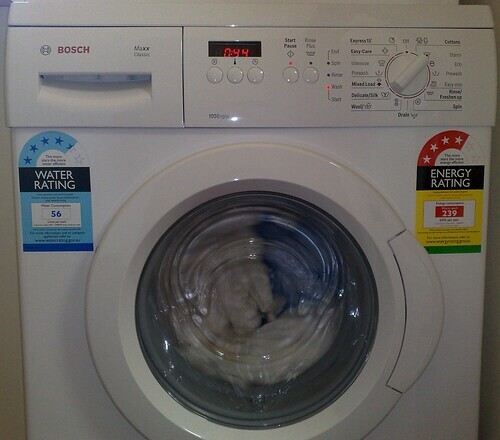 It uses less electricity, water and washing powder than a top loader, and does less damage to clothes too. Yet the majority of Australians continue to buy top loaders. If governments were serious about energy and water conservation, these guzzlers would be banned! Your smugness will be even greater if you use the cold water setting. Choice Magazine tests have shown that using warm/hot water makes no discernible difference to the effectiveness of the wash.
DW’s comment is rubbish, and that’s why top loaders aren’t ‘banned’. My Fisher & Paykel top loader is just as gentle as a front loader, uses the same amount of water as an average front loader, uses less electricity (and had a four star rating when it was bought 16 years ago) and takes less time to run than a front loader. Granted, it’s far more efficient and better designed than the old style mechanical top loaders, which are still made for some reason, but to allege some magical efficiency attributable only to the axis on which the drum spins is dishonest. Go into a shop, look at the labels and see for yourself. Look especially at electricity consumption. The thing is, they rushed it to market and did not change the filtration system used to capture the dirt, suds, etc, so your clothes end up doing that instead. We have had it for about 2 weeks and had been incredibly confused at how poor a job it was doing – essentially having to wash clothes twice to make them clean. To Electrolux’s credit, they are sending someone out on Friday to replace our filters, but I am disappointed that this product made it to market, and is still being sold with a known issue. Philip, I knew I wanted a frontloader for space reasons, but a brief look at the water ratings seemed to indicate that although the toploaders use more water, the capacity tended to be bigger, so the water used per kilogram of clothes isn’t as big as some people might think. * They’re gentler on clothes. * Most use less water. * Most use less energy when washing in warm to hot water. * More programs, and higher temperature wash options. * Higher spin speeds, which means they get more water out – convenient however you dry clothes, and money-saving if you use a dryer. * Best for small spaces – you can fit most models under a bench or put a dryer on or above it. * Longer wash cycles – up to two hours in some cases (but many have ‘fast-wash’ options for lightly soiled clothes). * Generally more expensive to buy. * Higher spin speeds and less water (and higher wash temperature options) can mean more creases – so more ironing. Some models have ‘anti-crease’ cycles to avoid this. * With some models you can’t easily add to the wash load after the cycle has started. * Some models need special brackets if placed on a wooden floor. * Tend to have louder spin cycles, and some people are sensitive to the pitch. * Slightly fewer breakdowns and repairs compared to front loaders. * Faster normal program wash cycles. * Generally cheaper to buy. * Lighter and so easier to move. * Easy to add clothes once a cycle has started. * Tend to have better rinse performance. * Generally harsher on clothes. * Use up to three times as much water as front loaders. * Use more energy when washing in warm to hot water. Peel them off quickly! Leaving them on makes them harder to remove, and will leave faded ‘negatives’ on the enamel when you remove them later. If you don’t have eucalyptus oil (I’m reporting you for being unAustralian:) CRC or WD-40 will work. Unfortunately, as well meaning as Choice magazine are, they’re not the be all and end all expert on what works best in the real world. Words like “generally” , “some may” and “mostly” cover their butts. They did a recent review on cheap vacuum cleaners and not one was checked for ease of cleaning the filters, ease of emptying the bagless compartment, or cost of replacing the filters. All things that will help prolong the life of the vacuum cleaner. They also rated machines highly despite the fact they didn’t do a great job on vacuuming carpet, which is why vacuum cleaners were invented in the first place. So DW, as much as Choice conduct tests, your better off talking to an expert in the repair industry who deals with appliances all of the time to ask what’s better. There are crap front loaders and brilliant top loaders. And just because the Govertment is behind a push for people to change over to them doesn’t mean that they’re a great option (see shonky insulation fitters, why a compact fluoro globe isn’t a great idea for a stairwell or a bathroom).